In summer 2014, emails were flying between faculty affiliates at the Institute for Transportation (InTrans) and their counterparts at Bogaziçi University in Istanbul, Turkey. As part of the Midwest Transportation Center’s (MTC) focus on academic enrichment, the professors were planning the details—classroom courses, field trips, and sightseeing—of a 2015 study abroad experience for interested students at Iowa State. Transportation engineering is an increasingly global profession, and international studies significantly enhance students’ academic experience. For two weeks in May 2015, participating students will be immersed in global transportation topics at the English-language Bogaziçi University. 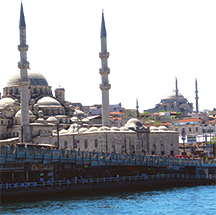 A cultural and entertainment hub and a dynamic center of global commerce, Istanbul is a premier location for transportation studies. The city straddles the Bosphorus Straight between Europe and Asia and is served by a complex, modern transportation network, including two international airports, three shipping ports, a “chunnel,” and a ferry system. Four professors from Iowa State University’s Department of Civil, Construction, and Environmental Engineering (CCEE)—Shauna Hallmark, Omar Smadi, Chris Williams, and Halil Ceylan—will accompany the students and share instruction with other visiting professors. This opportunity is being organized by the MTC at InTrans and the CCEE Department.